Following the recent introduction of electric scooters in Brisbane, several other Australian cities have expressed interest in trialling e-scooters. Electric scooters have received mixed responses since their introduction in Brisbane, with many users hailing their convenience and ease of use, while others have criticised the technical glitches that led to several serious rider injuries . Nevertheless, Adelaide recently extended e-scooter trials in their CBD  , with Melbourne also undertaking a small-scale electric scooter trial at Monash University , and Canberra expressing interest in trialling e-scooters in the future . As such, it seems likely that e-scooter trials will continue to occur in Australian capital cities. Accordingly, new research by Budget Direct reveals over 40% of surveyed Australians want electric scooters to be introduced in their capital city, with more than one third also saying they would use an electric scooter from an electric scooter company. The survey collected responses from 1,000 Australians to gauge their attitudes towards electric scooters. Respondents were fairly evenly split over whether they wanted electric scooters to be introduced in their capital city. 57.8% of respondents said they did not want electric scooters to be introduced in their capital city, while 42.2% were in favour of electric scooters being introduced. Electric scooters were more popular among younger Australians, with 44.2% of respondents aged 18-34 in favour of introducing electric scooters, compared to 36.6% of surveyed 55+ year olds. 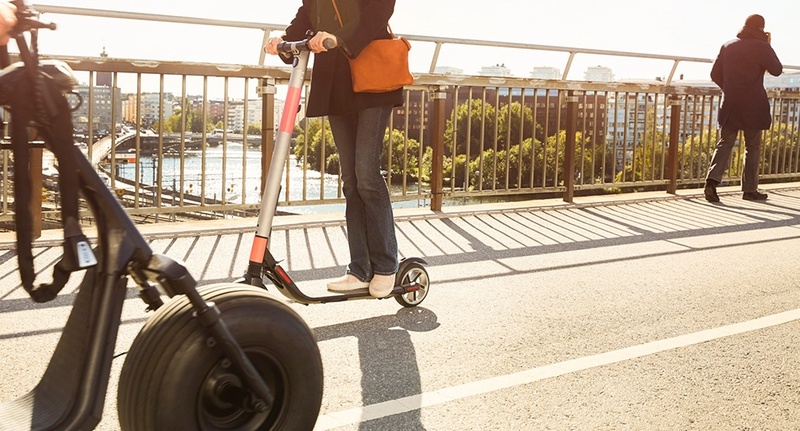 Respondents were slightly more like-minded when it came to riding electric scooters, with 62.8% saying they wouldn’t use an electric scooter from an electric scooter company, compared to 37.2% of surveyed Australians who said they would use an electric scooter. Once again, younger respondents were more likely to have a favourable view of electric scooters. 42.4% of respondents aged 18-34 said they would use an electric scooter, a figure which dropped to 28.7% of 55+ year olds. So far, electric scooters have proved to be popular in Brisbane, with 131,000 unique riders using e-scooters more than 500,000 times since their introduction in November 2018 . More than half of surveyed Australians (55.8%) think electric scooters ‘pose the greatest danger’ to pedestrians. Conversely, just over one quarter (26%) of respondents think electric scooters are not dangerous. 14.2% of respondents think electric scooters pose the greatest danger to motorists, while 4% think cyclists are most at risk. This means that 74% of surveyed Australians think electric scooters are dangerous in some way. Men were slightly more likely than surveyed women to think electric scooters aren’t dangerous, 29.8% vs 22%. Additionally, 65.4% of respondents said they would not feel safe sharing a footpath with an electric scooter. Again, a clear age divide emerged: 50% of surveyed 18-24 year olds said they would feel safe sharing a footpath with an electric scooter, compared to just 20.7% of 55+ year olds. To put this in context, electric scooters can only be ridden on footpaths during ongoing trials in Adelaide and Brisbane. Thus, it seems likely that similar rules would be enforced if electric scooters were trialled in other Australian cities. Pedestrian safety has been a concern during electric scooter trials in Brisbane, with a number of collisions and near-misses reported. However, so far, e-scooters have posed the greatest danger to riders, with technical glitches causing a number of serious injuries . In total, 60 e-scooter related injuries were reported in Brisbane between November 2018 and January 2019 . It should come as little surprise that respondents were concerned about pedestrian safety, as 67.1% thought scooter companies would not ensure sufficient education on the laws of electric scooters before introducing them. Similarly, 61% of respondents were not confident that authorities would police bad rider behaviour, such as sticking to the speed limit, riding without a helmet, and erratic riding. Again, a clear generational divide emerged: 48.3% of surveyed 18-34 year olds were confident authorities would police bad rider behaviour, while 28.5% of respondents aged 55+ were confident authorities would police bad rider behaviour. These concerns might be justified, as electric scooter riders not wearing helmets has been an issue in Brisbane , while several riders in Brisbane and Adelaide have also been charged for drink riding on electric scooters . 68.3% of respondents think electric scooter riders should be liable if they damage property or injure someone, while 11.2% think the electric scooter company should be liable, 8.4% think the damage should be covered under public liability, and 12% are unsure who should be liable. Interestingly, most respondents favour lower speed limits for e-scooters. To put this in context, during ongoing electric scooter trials in Brisbane, riders can travel at up to 25km/h, while during ongoing electric scooter trials in Adelaide, riders can travel at up to 15km/h . Even so, 47.2% of respondents think electric scooters should have to travel at 0-10km/h. 27.8% of respondents think electric scooters should have to travel at 10-20km/h, while 12.7% think electric scooters should have to travel at 20-30km/h, and 12.4% think electric scooters should have no speed limit. Younger respondents were likely to favour higher electric scooter speed limits, with 53.9% saying electric scooters should be able to travel at more than 10km/h. In contrast, 64.1% of surveyed 55+ year olds think electric scooters should have to travel at 0-10km/h. Respondents were more evenly split about where they thought electric scooters should primarily be ridden, with 39.9% saying they should primarily be ridden in cycle lanes, 20.8% saying they should primarily be ridden on the road, 20.3% saying they should primarily be ridden on footpaths, and 18.9% responding ‘none of the above’. In Brisbane, electric scooters can currently be ridden only on footpaths, while in Adelaide, electric scooters can be used “on footpaths and other shared paths unless otherwise prohibited” .